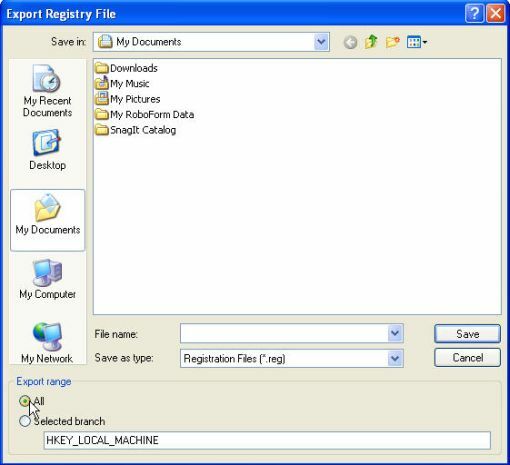 "Backup Windows Registry - Knowing the Why and How to Backup Registry!" Do you think that backup Windows registry is an easy task? Or have you think of why you need to backup your computer registry? you may need to manually repair the registry due to an error on your system. for those more advanced users, you may want to tweak your computer registry to boost your computer performance. So, if you are not backup Windows registry before trying to change/modify it, you are in danger because a minor change on the registry may caused your Windows problem. The Export command available on the Register Editor can exports either the whole registry, or only a part of it, as a REG file or an ASCII file. Normally we choose to backup the entire registry. Here I will illustrate a step-by-step approach with screenshots to guide you on how to backup the Windows registry. 1)	Make sure the file type is set to Registration Files (*.reg). You do not want to want to save as txt as you will not be able to import the registry file in the event that your windows registry is corrupted. 2)	Under the Export range section, click on the radio button 'All' as you want to backup the entire registry file, not just part of it. Once finish, click the Save button to start backing up the registry. Just wait for few moments and the entire process will be complete. The steps to backup Windows registry here can either apply to Windows XP or Windows 2000. If you already backup the registry, and can always restore back the registry in case there is any problems. For more details steps, read the article on restore windows registry. If you need the registry scanner and cleaner software, I recommend you get this award-winning Windows Registry Cleaner.